We are glad some readers enjoyed our description in the last post of the exceptional A Faith & Culture Devotional, and we’re hoping it will be a surprising and appreciated gift for many. Maybe you’d like to give a more traditional devotional as a gift, but don’t want just the same old mediocre inspiration. Here are a few different ones. Maybe one of these would please that special someone. The Glenstal Book of Readings: For the Seasons (Liturgical Press; $29.95.) This is a pocket sized prayer book full of readings from some truly remarkable theologians, writers and philosophers arranged as readings to be used to supplement the Divine Office (or, of course, by itself) during Advent, Christmastide, Lent and Easter. You may know that a few years ago when the odd publishing phenomenon of the Prayer of Jabez was taking North America by storm, the Irish Benedictine Columba community’s Glenstal Book of Prayer became (a more spiritually substantial) sensation on the best seller lists of Europe. We stock that interesting little prayer-book, still…This new sleeved book of readings is produced by the same folks with very lovely leather, a strong ribbon marker, two color ink, and quality paper. Readings include authors such as Hans Urs von Balthasar, Raymond Brown, Hildegard of Bingen, Martin Buber, Kallistos Ware, Karl Rahner, Romano Guardini, John Henry Newman, Richard Bauckhan, John O’Donohue, Elisabeth Schussler Fiorenza, even Karl Barth. The Tender Words of God: A Daily Guide Ann Spangler (Zondervan; $16.99) This is a collection of the Bible’s most tender words, designed to remind us of God’s immense love for us. This is a beautiful glimpse of God, from God’s own words, arranged for morning and evening readings, a text and a prayer. As Ann tells of her purpose, “I wanted to know God’s love that is lavish…so that I could love more fiercely.” Wow. A compact hardback with an embossed cover and a beige ribbon marker. This is very, very nicely done, and could be really a God-send for many, inviting us to prayer consideration of the very words of God. 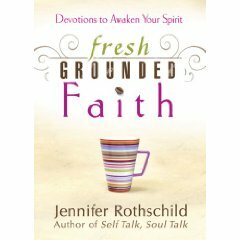 Fresh Grounded Faith: Devotions to Awaken Your Spirit Jennifer Rothschild (Harvest House; $13.99) Rothschild is a popular author on the “Women of Faith” circuit, the author of the very moving memoir of her blindness (Lessons I Learned in the Dark.) Here, she runs with the coffee schtick, with each daily reading followed by sections cleverly called “What’s Percolating in Me: My Response”, “Spill the Beans: My Prayer”, and “Thanks a Latte: My Praise.” There’s even a website to order a special free blend of her own roast. May be just right for a coffee lover who wonders what is brewing inside, how to hear from the fresh God of the Bible, and what it means to be grounded in Him, secure, stable, rich. Might it be said that we then become a pleasing aroma? Check out this promo video about her. 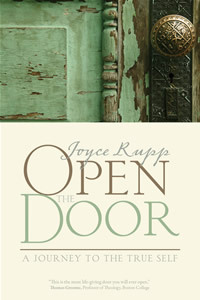 Open the Door: A Journey to the True Self Joyce Rupp (Sorin Press; $17.95) This Catholic sister is a master at plumbing rich metaphors (Fresh Bread; May I Have This Dance; Broken Cup, among others) and placing them into workbook journal/devotionals. This new one is a beautiful exploration of the image of the doorway, and is reflective, allusive, contemplative, suggestive. We’ve met Joyce, have truly enjoyed her nearly mystical presence and mature teaching, and are happy to celebrate this brand new set of creative meditations. By the way, we’ve long appreciated her book Praying Our Goodbyes (Ave Maria Press; $12.95) also, which may be a good resource from some this time of year. Regardless of one’s sadness or grief, we can—as the old hymn puts it—“take it to the Lord in prayer.” In her distinctively Catholic way, Rupp gently helps us do just that. Highly recommended. 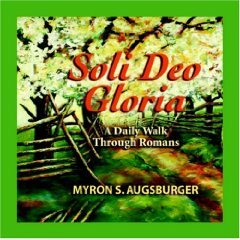 Soli Deo Gloria: A Daily Walk Through Romans Myron Augsburger (Herald Press; $14.99) Looking for a mature yet pleasant romp through one of the most content-rich portions of Scripture? Want a guide who is not only deeply evangelical in his commitments to historic Christian doctrine, but who is socially engaged, aware of the needs of the world, and eager to rediscover how simple living, peacemaking and wholistic witness can emerge from the Scriptures? Myron is a deeply respected man, a fruitful Mennonite leader and evangelist and one whose experience in higher education has made him a mentor to many. This is a page-a-day coolection on the very gospel of God, found in the story of this remarkable letter written to the faith community struggling in the heart of the Roman empire so many years ago.